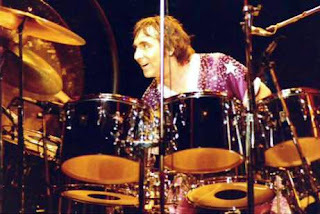 Keith Moon was best known as drummer & soul of the Who, considered one of the greatest drummers of all time. His manic, lunatic side, and his life of excessive drinking, partying, and other indulgences, probably represented the crazy side of rock & roll, as well as its self-destructive side, better than anyone else. His drumming technique was a rolling across the tom toms & cymbal crashing style, as opposed to just keeping a back beat like most drummers of the time did. In 1965 he put two kits together and played them as a whole, using the double bass drum sound at his feet. He used the kit as a lead instrument and gave the Who their hard backing sound. 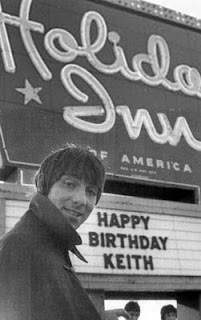 Keith was born August 23, 1946 in London England. He dropped out of school and began playing drums at age 14. In 1964 at a WHO show, Moon looked up to Roger Daltrey and said "I hear you're looking for a drummer. Well, I'm much better than the one you've got." The band hired Moon after seeing him practically smash the drum kit to pieces. He would play for the Who from 1965s My Generation album through 1978s Who Are You. He lived the life as the excessive rock star. Moon was a famous drunk & very heavy drinker known to dr ink a bottle of champagne & Courvoisier for breakfast. He loved to dress up in costumes ranging from Adolf Hitler to gangsters to drag. His sexual antics were also wild including S & M with whips, leather masks & multiple female partners. Moon became famous for smashing his drum kits and kicking them apart. During the Smothers Brothers television show, he loaded the drum kit with explosives which detonated during the finale of "My Generation," singeing Townshend's hair and embedding a piece of cymbal in his arm. Another time, he filled clear acrylic drums with water and goldfish, playing them for a television appearance. When asked "What happens with your goldfish?" he replied with a grin, "Well I mean, you know...even the best drummers get hungry." Antics like these earned him the nickname "Moon the Loon." He was notorious for destroying hotel rooms & homes. He loved to throw furniture out the window, and flush fireworks (M-80s) down the toilet blowing out the plumbing and destroying other toilets in the hotel. Once, on the way to an airport, Moon insisted they return the hotel, saying, "I forgot something!" When the limo returned, Moon ran to his room, grabbed the TV while it was plugged in, threw it out the window and i nto the pool. Back in the limo sighing "I nearly forgot." In 1967 Moon drunk at his 20th birthday party in Flint Michigan, drove a Cadillac into the Holiday Inn pool. This led to the Who being banned from The Holiday Inn for life. In 1970 he left a London club escaping skinheads attacking his Bentley and accidently ran over & killed his limo driver. On the 1973 Quadrophenia tour in California, Moon took a large mixture of animal tranquilizers and brandy. He passed out on the drum kit during the show. Pete Townshend got a member of the audience to fill in. 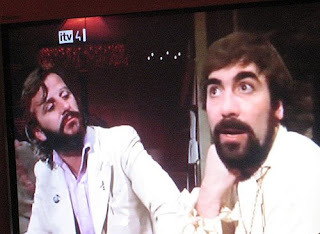 His close friend Beatle Ringo Starr tried to warn Moon that if he kept up this life style he would be dead soon. Moons only reply was a serious “I know”. On Septemb er 6th 1978 Keith Moon, his girlfriend, Paul & Linda McCartney saw the preview of The Buddy Holly Story and went out to dinner in London. Moon returned to a flat on loan from Harry Nilsson and died of an overdose of a sedative prescribed to alleviate his alcohol withdrawal symptoms. He was trying to detox on his own, but there was a dangerous high risk when this medication is mixed with alcohol. The pills were also prescribed by a new doctor unaware of Moon's recklessly history & sedative abuse. He had given Moon pills, telling him to take one whenever he felt a craving for alcohol (but not more than 3 per day). The police determined there were 32 pills in his system when he died. Moon died in the same room where Cass Elliot of the Mamas & the Papas had died four years earlier of a heart attack. 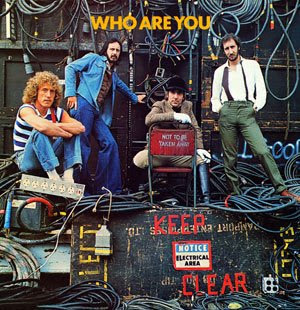 Moon died right after the release of the Who’s great "Who Are You" album. On the album cover, Moon is seated on a chair labeled "NOT TO BE TAKEN AWAY." 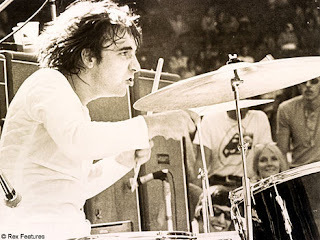 Trivia: Keith Moon is credited with naming the band Led Zeppelin. Telling them when they formed they would go down like a Lead Zeppelin. Keith taught Ringo Starr’s son Zack Starkey to play drums and was referred to by Zak as Uncle Keith. Starkey has been playing drums with The Who since 1994 and has been the closest thing to Moon. FERRAGOSTO 2008 - "Little Italy in the Bronx"